I was born in 1944 and had a bright childhood. Religion did not play a great part in family life. I don´t remember having heard about Jesus until I started in first grade at the age of seven. I remember about that time that The Watchtower and Awake! came regularly to our home. It was my mother who was interested in the message of Jehovah´s Witnesses. My father was not interested. Although I and my siblings were told about the coming Armageddon and the new world that was to follow, our lives were not affected much. We celebrated Christmas and birthdays and painted Easter eggs. Later on the cold war worried me. The arms race between the United States and the Soviet Union fitted in with my mothers´s world view which she had from the Witnesses. My mother was baptized as a Witness in the spring of 1958, and a few months later a charismatic Special Pioneer succeeded in starting a Bible study with my father. The book “Let God Be True” was used. The entire family took part of the study, and in December 1958 all in the family agreed that we should stop celebrating Christmas. In the summer of 1959 I was baptized at a District Assembly, being just 15 years old at the time. My father was baptized the following year and eventually my two younger sisters were baptized as well. In 1959 my brother was just five years. Quite a few years passed before he was baptized. We all participated in the activities of the local congregation. Soon my father was appointed the Assistant Congregation Servant, as the title was named before the elder arrangement was introduced in the early 1970´s. We did not face any particular problem in the Witness community, and in 1963 I spent my first month in prison for refusing military service. In 1965, when I was facing a two months sentence for the same reason, I decided to go to the very bottom of all the Witness beliefs in order to be able to convince others of our faith. It was then I made my first devastating discovery. The Witness doctrine about the “seven times” of the Gentiles could not be found in the Bible! Not a single clue about the alleged 2,520 years claimed to end in 1914 was found in the Scriptures! The whole doctrine was hanging in the air. I talked to other Witnesses, even prominent ones, about it. Nobody had any solution to the problem and nobody seemed to care. So I had to conclude that one important Witness doctrine was in error. My attitude was that this error would soon be discarded by the organization. I began to study church history and continued to study the Bible independently. In 1967 I got quite a blow when corresponding with a baptist pastor. I had been living under the impression that preachers and clergymen did not have any knowledge of the Bible and was shocked to find out that this man knew more than I did and that much of the Watchtower doctrine was shaky. However, that text showed that David and his men ate, not “a small amount” or crumbs of bread that was forbidden, but sufficient amounts of sacred bread to alleviate hunger! The need, not the amount, mattered. Again, the only legitimate way to rely on that text was to apply it to all medical use of blood, and without limiting the use to “a small amount”. Not surprisingly this was not done. In 1972 I met Birgit, a pioneer, and we married on December 2 that year. Birgit was also critical of some of the Witness doctrines. She gave up pioneering before we married. It was in 1973 that I started to research the history of the Watchtower movement. I had seen contradictions in the movement´s historical presentations and wanted to find out especially about the events immediately following the death of C.T. Russell. It was claimed that Judge Rutherford and his supporters had acted faithfully and as a result had been chosen as “the faithful and discreet slave” following Christ´s alleged coming to his temple in 1918. Their opposers, it was claimed, had acted unfaithfully and so were rejected as “that evil slave”. This was a crucial Witness teaching, but I soon found that Rutherford and his crew had used foul to secure power and that the attitude of the so called “opposition” had been more than justified. This meant of course that the claim about the elevation of “the faithful and discreet slave” went down the drain. 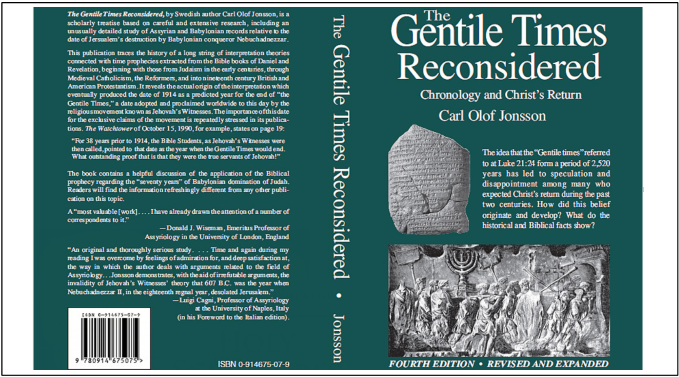 In the summer of 1974 I met Carl Olof Jonsson at a District Assembly in Göteborg. We had common friends who thought that we should be in touch. It was as a result of our extensive discussions that Carl decided to write a treatise about 1914 and send it to Brooklyn. While Carl wrote the treatise I participated in the preparations. I still remember the thrill we got when Carl, after long study, was able to conclude that the Babylonian tablet VAT 4956 annihilated the year 607 B.C.E. as the date of the destruction of Jerusalem under Nebuchadnezzar. Carl´s study caused quite a stir at headquarters. Ray Franz and Lyman Swingle of the governing body were impressed with the study, but the majority of the body did not want to discuss it. In 1981 the book “Let Your Kingdom come” in a most imperfect and incomplete way attempted to deal with Carl´s evidence, which was unfairly dismissed. Carl then decided to go public with his treatise. Before he could do so he was disfellowshipped. But his study was first published in Swedish in 1983 and afterwards in four consecutive English editions, the last and very expanded one in 2004. During this time we also began to research the the alleged “signs” of the last days, specifically wars, famines, pestilences, earthquakes and crime. We were astounded to find that there had been no increase of these difficulties since 1914 as claimed by the Society. In fact, especially famines and pestilences had befallen mankind to a greater degree before 1914 than after that year. 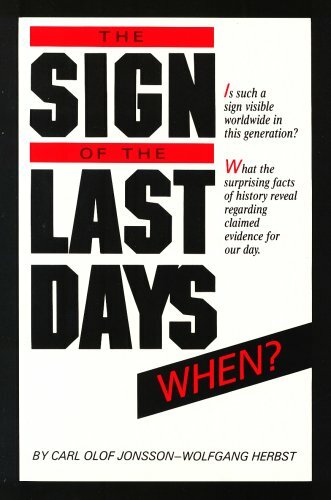 Our book “The Sign of the Last Days –When?” was published by Commentary Press in 1987. I used the pseudonym Wolfgang Herbst for the book out of concern for my father and my brother, who were staunch Witnesses. When the German edition was published much later both had passed away. That is why the German edition had my real name on the title page. In 1986 I had one of the most insulting experiences in my entire life. Because of the famine in Ethiopia I and my wife decided to join the Red Cross. Somehow my membership came to the attention of the local elders. They did not realize that Red Cross membership was a perfectly acceptable matter from a “theocratic” point of view. Instead of talking to me about it they wrote, behind my back, to the Branch and asked if i they should bring me before the Committee to find out if I had broken my Christian neutrality. The Branch did not know but stated that they would contact the brothers in Brooklyn to find out. In time a two-page letter was sent to the Presiding Overseer. The absurd claim was made that the Red Cross in a number of ways was operating in conflict with Isaiah 2:4. The elders were instructed to have me answer five questions and send my answers to them for scrutiny. I was able to get the questions in advance and wrote a lengthy systematic reply, which they forwarded to the Branch. The local elders were fairly sure that I would be disfellowshipped. One of them moaned to the effect that I was a criminal. I myself was sure that the Branch would not dare to do anything. And sure enough no reaction came although the elders tried to get further information. I had managed to get copies of both letters written by the Branch and they obviously did not want to have more confidential material spread around. Although the elders soon realized that they had lost the game, no excuse was received from them. All levels of the organization were involved in this dirty affair: the local elders, the circuit overseer, the Branch Committee and the governing body. After this I no longer considered these people as Christian brothers. Their behavior showed a thoroughly sick organization, totally devoid of sympathy and Christian love. My wife and I had already decided to leave, but we did not want people to think that the Red Cross incident was the sole reason for leaving, so we waited more than a year before we axed the organization. We took our time to prepare suitable resignation letters. We explained that while we wanted to be Christians we could no longer identify with an apostate organization. We provided biblical reasons for our position and sent out the letter to a good number of people. A brief letter was also sent to the Branch and another one to the local elders, all letters arriving at the same time. This was in October 1988. We indicated to the elders that if they would badmouth us we would take action. We allowed them to state to the congregation that we no longer wanted to be connected to the Watchtower organization, as explained in our general letter. The presiding overseer announced our resignation in harmony with our instructions. A few months after this I and my wife were invited to a Christian conference in California and I was asked to participate in the program. It was here that I and my wife were baptized “into Christ” under water in a pool on Saturday, July 22, 1989. This meant that we no longer considered our earlier Watchtower baptisms as valid. For a number of years I then helped Carl Olof Jonsson to publish a Swedish quarterly called “Informationer” (“The informant”), examining various Watchtower views. I had six articles published stressing the absence of the name “Jehovah” in the New Testament and also eight articles bearing on the date of the last meal of Jesus with his disciples, showing that it took place on Nisan 15 rather than on Nisan 14 as the Society claimed. In 2003 we concluded that “Informationer” had served its purpose and discontinued it. I have resumed my project from 1973 about Rutherford´s takeover in 1917 with the aim of publishing a book. When my father died in December 2004 we learned about it only from an obituary in the local newspaper, and it was stated that the funeral had already taken place. Our children had never been baptized Witnesses but they had not been informed. Obviously it was thought that if they had been informed I and my wife would have come to the funeral, and our presence there was not wanted. As people who had rejected the organization we were treated as if we were dead. In spite of our experiences both my wife and I are happy people, enjoying life. We have maintained our Christian faith and have had the pleasure of seeing our two children becoming baptized Christians, marrying Christian spouses. Life has never been better than it is now. As the article contributed above by Rud indicates, he has worked for years researching issues with his personal friend, Carl Olof Jonsson. The book mentioned below was the result of some of that research. 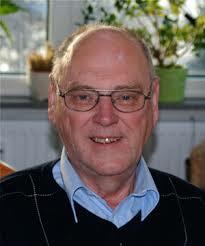 The portion of the authorship credited to Wolfgang Herbst is actually a pseudonym; it’s the work of Rud Persson. The Sign of the Last Days deals with the belief taught in many denominations that the prophecies in Matthew 24, Mark 13, and Luke 21 refer to our generation. The most well known of these groups are the Jehovah’s Witnesses. This belief includes the idea that pestilences, famine, earthquakes, war and most social problems took a drastic turn for the worst at about the turn of the last century. The belief implies that things were pretty good until recently, and now things are rapidly going downhill in a handbasket. In some ways this is true, but is this the complete story? After reading this book the reader will be thankful to be alive today, and will count his or her blessings. The authors, both active Christians, do a masterful job evaluating historical trends as related to the concerns usually included in the “Last Days” teaching. For those who love history this book is a fascinating read. And for all Christians it will help you place your faith on an historical basis. For anyone interested in eschatology, the book is a must. The book is also a must for anyone interested in the Jehovah’s Witnesses. The author, Carl Olof Jonsson, sees Billy Graham, Hal Lindsey (“The Late Great Planet Earth”), Jehovah’s Witnesses, the Worldwide Church of God, and others as misrepresenting Jesus’s eschatalogical discourse in a similar way. This is surprisingly good reading material for anybody interested in New Testament eschatology. Jonsson devotes most of the first 200 pages of the book to historical analysis of famines,wars, pestilences, crime, and earthquakes to present a strong case that we live in one of the safest times in history. So, if Jesus really meant that he would return during a particularly dangerous time, we could be sure that he wouldn’t come now. The copious references, charts, and quotations inspire confidence in the material. Jonsson shifts gears by doing scriptural analysis in a chapter called the “Myth of the Composite Sign” to show a different way Jesus’s words can be read without taking liberties with the text. This frees the reader from the assumption he needs to look for a particularly troublesome time. The book is underpriced and you will probably want to read it two or three times. Jonsson cites some authors with unusual views. I was motivated to track down and buy at least one book just from reading his footnotes. This book helped me a lot….thank you so much for taking the time to write it! !